Magnetoresistance is the capacity of compounds to be changed from electrically resistant to electrically conductive depending on the presence of an external magnetic field. The ability to switch from metallic to insulating behavior makes magneto resistant materials potentially very useful for electronic and spintronic devices. “Colossal” magnetoresistance (CMR) in magnanite compounds such as lanthanum manganite, LaMnO3, has practical applications in magnetic sensors and random access memory for computers. Manganite compounds are particularly promising when it comes to CMR, because the change from insulator to metal is several orders of magnitude stronger than in related materials. Understanding and controlling and this phenomenon has remained largely elusive, however. CMR has been induced in chemically doped manganites, but thus far not in the pure material. 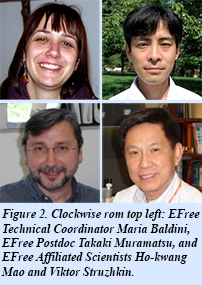 New research from EFree Technical Coordinator Maria Baldini and EFree affiliated scientists Ho-kwang Mao, Takaki Muramatsu, and Viktor Struzhkin, shows that pressure may be used to successfully induce CMR in pure LaMnO3. This is the first time that CMR has been observed in a pure material. Results from this work are published in the Proceedings of the National Academy of Sciences [M. Baldini et al, Proc. Nat. Acad. Sci. 112, 10869 (2015)]. The transition from insulator to metal in LaMnO3 takes place at about 32 GPa. By examining LaMnO3 across a range of temperatures and pressures, it is observed that, under pressure LaMnO3 separates into two distinct phases, one metallic and one non-metallic. The chemical structure of the non-metallic phase is distorted, and the metallic phase is not. The insulator-to-metal transition occurs when the metallic phase exceeds the non-metallic one by a certain threshold. This is confirmed by theoretical predictions. But the existence of a period when the two phases are mixed together is the crucial ingredient for inducing colossal magnetoresistance (Fig. 1). The phenomenon occurs when the competition between the two phases is at its maximum. The physical separation of the two phases and the interplay between the deformed structure and the non-deformed structures is the key to driving the colossal magnetoresistance. The ability to induce colossal magnetoresistance by applying pressure to a pure, undoped sample is a major step forward in understanding the physics underlying the phenomenon and to potentially harnessing it for practical purposes. This work was supported by EFree, with additional support provided by the European Union Seventh Framework Research Programme (Graphene Flagship).